Big news in open source/cloud. IBM announced this afternoon that it will acquire open-source software company Red Hat for $34 billion. The deal will help IBM expand its reach as an enterprise cloud computing provider. Yeah, this is huge and unexpected news. The rumors that Red Hat will stay its own entity are encouraging. RedHat has been super revolutionary for open source and it offers a really cool business model for open source companies. I hope this is a net positive for them! The rumors that Red Hat will stay its own entity are encouraging. Yeah, both sides have said that Red Hat will continue to call their own shots, but basically every big software buyout nowadays says the exact same thing in order to preserve stock prices. Doesn't really mean much, sadly. The thing is that if they do not manage to not piss people off, they just threw $34b out of the window - there's pretty much nothing else of value in RH. All the code is out there for anyone to copy (and Oracle did copycat a product and pretty much failed). Of course few people will give them a finger and go work for Google or someone from 21st century right away, but the internal sentiment is more positive than I would thought. Of course it's more positive: the likeliest alternatives were Oracle (barf) or maybe Microsoft (far less barftacular than an Oracle acquisition but still likely to set off religion-based quitting). Plus, if you've been at Red Hat for a while, that $190/share against whatever's in your ESPP goes a good way towards salving any potential chapping. It’s also the only logical thing to do short term. Red Hat has to be a pretty complicated organization. Context: I am someone who interned there for 2 summers a few years ago (I did get to sit on one conference call with Lennart Poettering...). I imagine there is a moderately sized group of people who are very upset about this and either already are or will soon be making a fair bit of noise. Internally there was a company-wide mailing list called memo-list on which anybody could send an email and have everyone else in the company see it. Lots of very big disputes took place on it (most notably when I was an intern: IT decided that maintaining internal sendmail servers was no longer tenable and switched to gmail. Lots of people were mad about this). There were lots of folks who were passionate about Red Hat as a company and its place in computing history and in the open source community. And another interesting challenge will be that a large proportion of the company works remotely. In my time as an intern, there were desks in the office that ostensibly belonged to people (they had possessions and papers sitting on them) that I never saw in my 6 cumulative months there. IBM, notably, changed its stance on remote work relatively recently. IBM and Microsoft being the torch bearers for open source. If you can’t beat ‘em, join ‘em. Microsoft is the biggest OS contributor on GitHub (well before the acquisition). It's kind of hilarious if you think about it. OSS is bigger than just GitHub, also how do you measure bigness in OSS? By number of committers? Commits? SLOC? Involvement in other projects? You could argue the bigness of a company in OSS is even a smell. It implies they also have a lot of control. I was just nothing that I find funny how MS completely changed their stance on open source in a few years. The Nadella era has a very different tone than the Ballmer era. Don't run. We are your friends. I think IBM is floundering. This feels like a last ditch effort to remain relevant. 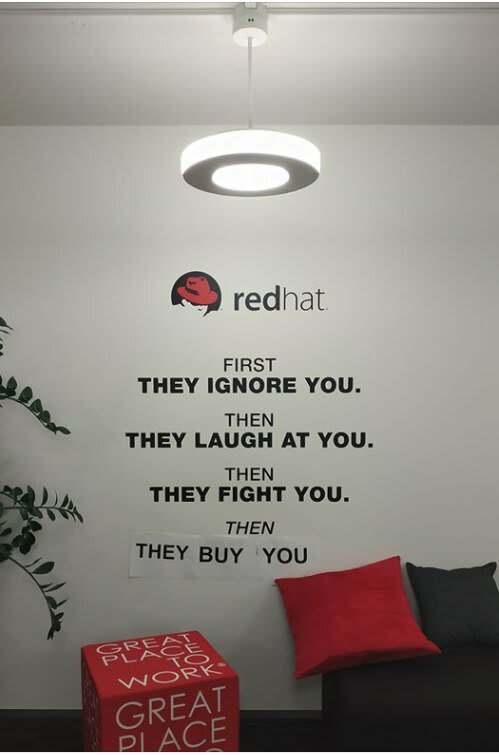 Not sure why RedHat would agree to the deal because they're actually doing pretty good on their own. I joined IBM thru an acquisition and left 18 months later. I was on the Watson Health side of the business which failed to deliver after promising the world. I sincerely hope buying Red Hat is a catalyst for changing IBM culture, but I wouldn't make any bets. Watson seemed to have so much promise. It's really a shame management bungled it so badly. I was really rooting for it. Huge headstart, but couldn't capitalize. IBM in a nutshell. I was an IBMer for 2 years. They laid me off on my birthday (of all days) last year. Everything about this feels that way, and I don't see IBM ever changing its MO. The people I see in my social network celebrating this are IBMers. Nobody from RedHat has had anything positive (or anything at all) to say. I think this will be like every other IBM acquisition. Ya, sadly I don't think this will change anything for IBM and most likely will make RedHat a worse company. I hope I'm wrong but nothing on IBM's part has signaled competence in the last decade or more. I’ve kind of felt this way my entire life about IBM. If their goal was to sell, 34 billion for an open source company seems something to celebrate! SoftBank paid less money to get ARM!! Interesting... mostly how could this have been done so quietly. Consume a lot of Linux/OSS media and nay a word. I am not biased by past blunders of IBM or Microsoft, so i still await a real opinion until something actually comes of it, to determine good or bad. The employees were pretty unaware of it too from what I've seen on social media, that being said I work for a company that was acquired recently and we had no idea until it happened either. That's even the case where I work (keeping sensitive business quiet), and I work for a relatively small company. I guess it just depends on who's let in on a given secret. Some people will keep it, and others will find a way to talk. One of the last remaining UNIX companies - IBM AIX is still a thing - buys the company that ruined Linux with the systemd fiasco. LOL. I am always fond of people who claim anything made by others—and proven to be a success—fiasco. 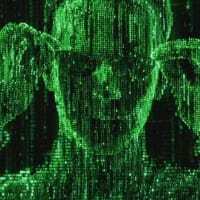 Several nerds unable to understand the reasons behind systemd are not an issue of the latter. Windows Vista was a success as well. Red Hat for me had become less relevant over time as they stopped servicing individuals to focus on commercial Linux. The one great thing was their commitment to GPL and FOSS. According to CNBC Red Hat will become a unit of IBM's Hybrid Cloud division. The vision of the company is clearly dead as it will be impossible to put the financial interests of IBM stockholders after principles. What can be monetized will be. What can't will be abandoned. At least this is the common approach taken when open source companies are acquired. I expect there will be forks as stakeholders in various projects act to protect themselves. I'm not a fan of big companies becoming bigger and getting even bigger pieces of the pie. I agree. It almost feels like open source will get consolidated away. Oh dear. I'm afraid of what will happen to their application integration stack. RedHat FUSE is a competitor to IBM Integration Bus and from a strategic standpoint IBM can't give full steam ahead for both products. I wonder which of those will be sold to HCL. However such a decision would be the lesser evil compared to an attempt to integrate one into the other. Perhaps IBM will consider re-entering the PC world too. If anyone has the finances, relationships and talent to go from A to B it would be IBM and with Red Hat it would be great to see an OS for the general public. I'm doing, but it's still nice to ponder the thought. Not super surprising. IBM's recent acquisition trends have been around trying to establish a beachhead in the cloud world. Their attempt, a few years ago, at buying Softlayer didn't work out super well (they still lag way behind Amazon, Azure, Alphabet and Alibaba). They've probably looked at Oracle and said, "being a meaningful CSP is probably a gone opportunity," and decided, "better to get a beachhead into all of them." Fits better with their consulting-heavy model, any way. IBM's been supporting Linux on their systems since the early 2000s. You could get "pure" Linux on LPARs or, if you preferred to stay on AIX and just dabble in Linux, you could run AIX with Linux extensions starting with the AIX 5L release. Plus, if the Power-series wasn't your thing - and you wanted to stay more on the "big iron" type of hardware - IBM's been doing zLinux for quite some time. Whether PowerPC or z-series, IBM always verified Red Hat support on their Linux-oriented iron. So, not a completely out of the blue nowhere move. And, given the alternatives, I'd really rather a consulting and semi Linux-oriented company like IBM buy Red Hat than company like Oracle. Then again, if Oracle was sniffing around, I gotta think that the Red Hat execs informed them "if you buy us, you can damned near count on every last one of the technical people heading for the door as soon as their ESPPs are able to be cashed out." Ohhhh I’m excited and curious to see what the next year brings, especially in the Kubernetes and containers area! Wow, I kinda lost a bit of respect for IBM now. I get that everyone in IBM then, has either passed or retired, but the IBM name is kinda ruined now. I'm excited that there seems to be an increased interest in open source in the broader corporate world. I like the way Jacks puts it. IBM buying @RedHat is not about dominating the cloud. It is about becoming an OSS company. The largest proprietary software and tech companies in the world are now furiously rushing towards the future. An open future. An open source software driven future. OSS eats everything. IBM is already a big OSS contributor, IBM is also big opening up internal projects and giving them to the OSS community. Where the likes of RedHat start to contribute to it. So IBM buying RedHat to get into the OSS market makes little sense to me. Maybe it's less of an attempt to enter the market, since you're saying they're already there, and more to expand in it. Breaking news like GitHub acquisition completed by MS in 2016. Well, what can you say this is a great business strategy for IBM to provide more robust and competitive service.